Appearance Matters: 5 Tips for Dressing for Success — TLC Leadership Options, Inc.
Have you ever put on a new outfit or a suit that flatters you and just felt like you could take on the world? That’s because looking good makes you feel good. And that increases confidence. Dressing for success remains an adage that holds true. It is important that your appearance is in alignment with the image you want to project. While that image can vary widely by industry- casual in tech companies; buttoned-down in banking- you always want to communicate confidence and competence. Cut and fit of the clothing: Your personal appearance communicates a lot about you. Consciously or subconsciously, one of the first things people will notice is how well your clothing fits and suits your figure. Know what brands or styles fit you well. For example: I’m short-waisted so in a fitted jacket that may mean buying a Petite. Over time, I have learned the designers that tend toward a shorter neck to waist measurement. Pants length and sleeve length are dead giveaways when something doesn’t fit properly. 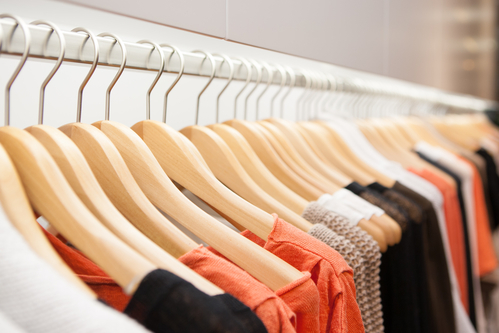 A high-end store or local dry cleaners can do alterations if necessary. If you have difficulty getting a good fit with off-the-rack clothing, you may want to consider buying several custom-tailored items. Good quality fabric: Like well-fitted clothing, good fabric subtly communicates quality and confidence. Every fabric has key characteristics. For cotton, the length of the individual fibers is important. Fabric made from long cotton fibers will be more durable, soft and will breathe better. High quality wool should be somewhat elastic, with no broken fibers or pilling. Synthetic fabrics can be blended with natural fabrics for their specific characteristics: lycra for stretch and closer fit; polyester for durability; or rayon for breathability. Learn more about fabrics here. Colors that enhance your look: When I first learned the impact of color, I was amazed at the difference it can make. This has to do with skin tone. If you have a warm skin tone, you look best in warm colors. Your skin has a yellow undertone and the warm versions of most colors will have more yellow in them. For example, cherry red is brighter because it has more yellow in it. Contrast that with a flat red that has more black in it. If your skin is lighter and has a pink undertone, you will look better in cool colors such as pastels. For women, a good tip is whether you look better in pure white or ivory/off white. This was brought home for me when I tried on wedding dresses. The first one I tried on was ivory and I didn’t like any of the white ones that followed. They simply made my skin and hair look dull and flat, by contrast the ivory was warm and flattering. There are simple ways to assess your skin tone whether you are a caucasian or a person of color here. For the men, please know that this applies to you as well. You can select a warm navy or gray or a cool navy or gray. If you are more warm-toned, you will look better in a gray or navy with more yellow tones. You will wash out in the light gray or a navy that has a lot of black. Your shirt is next to your face so take care in selecting the color. If you wear polo shirts, start noticing which colors flatter you the most. For more information, check out this website. Styles that flatter your size and shape: For women, a simple thing like three-quarter length sleeves vs. long sleeves may make a huge difference if you are short. A long-loose jacket may be more flattering if you have wide hips. Skirt length just below the knee, or longer, just below the calf muscle is more flattering. A skirt that cuts across the middle of the calf is less attractive because it emphasizes what is usually the widest part of the leg. While men’s professional wardrobes are focused on pants, there are many choices- and some styles work better for different body types. Pleats and cuffs are examples. Pleats add volume and proportion for men with broader shoulders and more comfort for men with larger thighs. Flat-front pants fit best on tall, slim men. Cuffs are flattering on taller men but not on short men. Pocket style, leg width and lining are other details to consider. Appropriate footwear: For some, shoes are artwork that covers the feet and and enhances and outfit. For others, the shoe is a means to protect and support the foot, nothing more. In an office, footwear is interesting and widely varied. If you have recently moved from working on the factory floor to a front office position, you are going to want to upgrade your shoes. Soft and comfortable may be appropriate for cement floors but it’s leather dress shoes if you want to look the part in the office. For women, 4-inch heels look more like club-wear and not very practical on hard floors; the same goes for super-high platform shoes. There are plenty of mid to low-heeled pumps and shoes that are flattering and functional for the office without being dowdy. Whether you go to work in jeans, a dress, or a suit, if you follow these guidelines, you will enhance your credibility, feel confident and instill confidence in others.